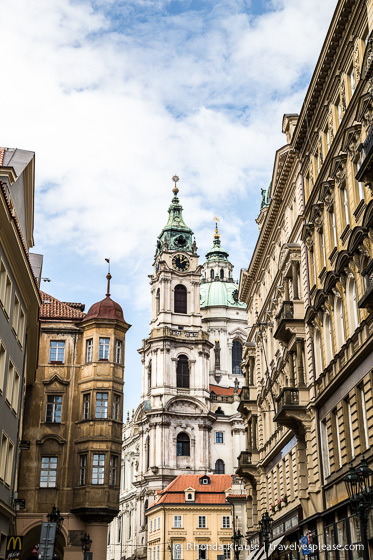 In Part One of our self-guided walk around Prague, we explored the Old Town, enjoying the architecture and atmosphere of Old Town Square, and the contrasts of the Jewish Quarter. When we last left off, we were crossing the iconic Charles Bridge, arriving into Malá Strana, also known as Prague’s Lesser Town. Greeting us at the end of Charles Bridge were the Malá Strana Bridge Towers. The two towers do not match, as they were built 200 years apart. The smaller tower was built it the 12th century. Named Judith Tower, it was part of the Judith Bridge before it was destroyed by floods in 1342. Interestingly, the tower was used as a jail for two centuries and later housed the customs office. 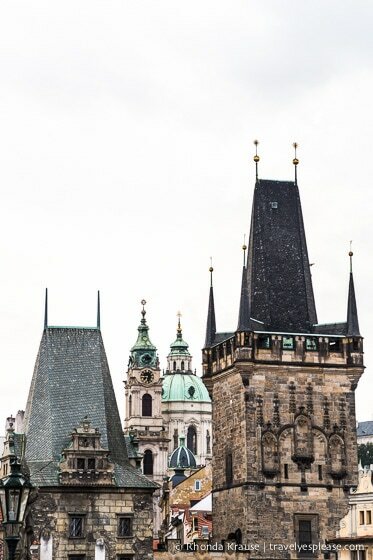 The taller of the two towers was constructed as part of Charles Bridge, but wasn’t actually completed until a century after it, in 1464. This tower was mainly used as a storehouse, but also as a watchtower. Connecting the two towers is a 15th century arched stone gate, creating a dramatic entrance to Malá Strana. Clustered around the foothills of Prague Castle is Malá Strana, one of Prague’s most historic districts. It was founded in 1257 by King Ottokar II of Bohemia, as the “New Town beneath the Prague Castle”. It became known as the “Lesser Town of Prague” in 1348, after Charles IV founded the “New Town of Prague”. The Baroque palaces and churches that give Malá Strana its charm were built after fires destroyed the district, once in 1419 and again in 1514. Today, Malá Strana is a bustling neighbourhood. There are many shops to browse, cobbled streets to explore and pubs and restaurants to discover. At night, it was a joy to wander. Lanterns lit the empty streets, making me feel like I was transported back to olden day Prague. Here are some of our favourite things to do and places to visit in Prague’s Lesser Town. The first place we visited after crossing Charles Bridge was Lennon Wall. John Lennon was admired by Czech youth for his commitment to campaigning for equality. After his death, this otherwise ordinary wall, was painted with Beatles lyrics and other Lennon inspired graffiti. Today Lennon wall remains as a symbol of peace, love and freedom. Completed in the 1735, St. Nicholas Church is one of the most important High Baroque buildings in Prague. The 65 metre tall bell tower was used to warn people of fire, and in Communist times, was used by the Secret Service as an observation point. Today St. Nicholas serves as both a church and as a venue for classical concerts. There is a church of the same name in Prague’s Old Town. On our way to Prague Castle, we stopped to enjoy a traditional Czech treat. Trdelnik is a sweet pastry made from flattened dough, which is then coiled on a roller and roasted above a fire. You can order them coated in sugar, cinnamon or nuts. The light and fluffy dough is just delicious! A short walk up the hill from Malá Strana is the district of Hradčany, better known to visitors as the Castle Quarter. We ended up spending more time walking around the romantic Hradčany neighbourhood than we did in the actual castle complex. Beyond the castle itself, there are many peaceful parks and beautiful lookouts. The views of the city are stellar! If you make your way to Prague Castle via Malá Strana, you will arrive at Hradčanské náměstí. It’s a square surrounded by aristocratic palaces, housing art collections and other treasured artifacts. The Guinness Book of World Records lists Prague castle as the largest castle complex in the world. It’s a 70,000 square meter collection of royal palaces, churches, halls, courtyards and one magnificent Gothic cathedral, St. Vitus. The history of the castle begins in the year 870, when the Church of the Virgin Mary was built. Through the course of time, many more churches were added and the first palace was erected during the 12th century. It eventually grew into what you see today, a mix of nearly every architectural style of the last millennium. Old Royal Palace- Home to Bohemian royalty from the 11th-17th centuries. Vladislav Hall is where Czech presidents are sworn into office. The Treasury of St. Vitus Cathedral. Today the castle is home to the Czech president and the crown jewels. Try and arrive just before the top of the hour so you can catch the changing of the guard outside the castle’s main entrance on Hradčanské náměstí. For a change of scenery, we headed across Powder Bridge, just north of the castle wall, and then down to Deer Moat. We enjoyed walking through the lush meadow where hunting events used to take place. From here, we climbed up a path that took us to a circular observation point, offering great views of St. Vitus and the castle. Prague is definitely a special place that pleasantly surprised us in many ways. We instantly fell in love with its beauty and warm welcoming atmosphere. Even though we stayed four nights, there were still entire neighbourhoods we didn’t explore because we were so enamoured with the Old Town and Prague’s Lesser Town. If we went back, I would love to visit Vyšehrad, Prague’s other castle, and stroll through the gardens on Petrin Hill. For more photos and information about Prague, visit Part One of this post: A Walk Through Prague- The Old Town. It’s free to wander the grounds of Prague Castle, but to enter the buildings you need to buy a ticket. The buildings are open from 9:00 am- 6:00 pm (April-October) and 9:00 am- 4:00pm (November- March). The castle grounds are open from 5:00 am – midnight (April- October) and 6:00 am-11:00 pm (November- March). St. Nicholas Church is open daily 9:00 am – 5:00 pm, but only until 4:00 pm from November to February. Lennon Wall is close to Kampa Island, in Velkopřevorské Square. * Information was correct at the time of publishing but can change without notice. Please confirm costs and times directly with service providers. Here is a trusted site that has a large inventory of tours and tickets for activities in Prague. You can book everything from walking tours, river cruises, concerts, pub crawls, airport transfers, and day trips out of the city. For your convenience, here is a list of accommodations in Prague. Please consider booking your Prague accommodations through the included link. It costs you nothing extra and helps support this website. Thank you!